A comprehensive programme of arias from such famous English oratorios as Esther, Saul, Belshazzar, Theodora, Judas Maccabaeus and Solomon. These oratorios contain a wealth of arias, duets and splendid overtures, of which one overture, eleven arias, and two beautiful duets are included here. The world-famous countertenor James Bowman is joined by The King’s Consort and the renowned soprano Susan Gritton. The birth of oratorio in England was a particularly curious event. At the Crown and Anchor Tavern on 23 February 1732, Handel’s forty-seventh birthday, his friend Bernard Gates directed three performances which reworked Esther, previously performed in 1718 as a Masque at Cannons. Gates conducted his choir from the Chapel Royal and, according to Viscount Perceval, ‘This oratoria or religious opera is exceeding fine, and the company were highly pleased’. Indeed, London’s first oratorio performances were such a success that Handel’s royal harpsichord pupil, Princess Anne, demanded that he stage the work at the King’s Theatre in the Haymarket. The Daily Journal announced a performance on 2 May of ‘The Sacred Story of Esther: an Oratorio in English. Formerly composed by Mr. Handel, and now revised by him, with several Additions, and to be performed by a great Number of the best Voices and Instruments. N.B. There will be no Action on the Stage, but the House will be fitted up in a decent Manner, for the Audience’. In the event, Esther was performed six times and Handel was able to invest £700 in South Sea Annuities after only the third performance. The need for Handel to find a new style of music with which to rekindle the interest of the public had been urgent. For twenty years he had been presenting operas in London, but the last seasons had been increasingly unsuccessful as audiences took against attending staged works in Italian. Many of Handel’s former friends and performers were deserting him and the result was both personal depression and a dwindling bank account. The success of Esther launched oratorio in London, and set Handel on a compositional path which was to prove his principal sphere of work for rest of his life. 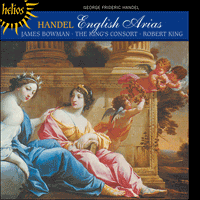 These English oratorios contained a wealth of arias, duets, splendid overtures and dramatic choruses. In Handel’s operas, arias were usually brought about through the dramatic situation: the oratorio arias generally present a wider comment on the human condition. Though the range of emotions may not be quite as wide as in the operas, the variety of moods, the quality of the melodies and the composer’s unique use of the colours of the orchestra is marvellously attractive. The ‘Musical Interlude’ The Choice of Hercules was first performed at Covent Garden on 1 March 1751, when it was offered as ‘an Additional New Act’ to the oratorio Alexander’s Feast. Nearly three-quarters of the score had been reworked from the music Handel (commissioned by John Rich, the manager of Covent Garden) had written for a production of Alceste. The play was never staged, perhaps because it had been conceived on too grand a scale, and the libretto disappeared: both Handel’s music and Servandoni’s scenery were recycled. The new Interlude was a simple allegory, with the young Hercules drawn in two different directions: on the one hand Pleasure offers him an easy life, with cool fountains, shady bowers, music, feasting and coyly phrased suggestions of possible amorous dalliance. Tempted by this, Hercules hears the admonitions of Virtue, by which he is eventually won over, and especially by the promise of immortality. Both Pleasure and Virtue present their cases at some length, but when Hercules does eventually have his say Handel presents him with an aria which is a jewel. The strings, playing in the rich key of E major, represent gentle breezes, over which the alto floats the most exquisite of melodies. The falling bass line under the final, single-note repetition of ‘Can I those wilds of joy survey’ is ravishing. The first performance of Saul on 16 January 1739 at the King’s Theatre was ‘met with general Applause by a numerous and splendid Audience’ which included the Royal Family. The approbation was deserved, for the work was full of great music, both for the soloists and for the chorus, and contained some especially spectacular orchestral colours. The amorous interlude that Jennens inserts into his plot concerns Michal, Saul’s youngest daughter, who has fallen in love with David. In view of Saul’s disapproval their feelings initially have to be suppressed. Only in the second Act, after David has been reprieved from a death sentence, are they able to declare their mutual love for one another, and they do so in a charming duet. Handel is in gloriously pastoral mood, backing the voices with strings and a pair of oboes. ‘Mr Handel’s head is more full of maggots than ever. I found yesterday in his room a very queer instrument which he calls carillon … with this Cyclopean instrument he designs to make poor Saul stark mad.’ During Act I, Handel’s new toy has its desired effect, and Saul, extremely jealous that David is said in battle to have slain ‘ten thousands’ against his own tally of mere ‘thousands’, imagines that his life is being threatened by the young warrior. David is innocent of the charge and is persuaded to sing a soothing aria to calm Saul’s madness while playing his harp. Although Handel waits until later in the score to introduce the instrument, the gently stroked string chords strongly evoke harp accompaniment, over which Handel floats another of his glorious vocal melodies. Handel’s Solomon, first heard at Covent Garden in March 1749, was a sumptuous score requiring double chorus and a large orchestra. Following four bellicose oratorios, Handel turned now to subject matter which presented a picture of a civilization in its golden age. There was probably a parallel to be drawn with England under George II, but Handel was also moving into his final phase of oratorio composition, choosing subject matter which matched his own personal beliefs. In Act I of the oratorio, after presenting the grand inauguration of Solomon’s newly completed temple, Handel moves the listener away to an idyllic countryside, where Solomon is in humble mood. In E major (the same key as ‘Yet, can I hear that dulcet lay’) Handel once again produces a gem, with a wonderful melody set over a gently flowing string accompaniment. The melody was later adapted as the hymn tune ‘Solomon’. After the opening celebrations of Act I, Solomon welcomes his wife, Pharaoh’s daughter (not to be confused with the Queen of Sheba, who does not appear until Act III), and promises her a new palace. We are left in no doubt as to the attraction Solomon feels for his queen and, to reinforce this feeling, Handel provides a hymn to their undying love. Set over a walking bass, ‘Welcome as the dawn of day’ is one of the composer’s most radiant duets, full of delicious interplay between the two soloists. The orchestral backing is beautifully judged, echoing the singers’ cooing ‘my queen’, ‘my king’ in the violins in octave jumps, whilst enhancing the solo lines with glorious countermelodies. The rich scoring of Solomon is nowhere more apparent than in the ecstatic instrumental writing heard at Solomon’s dedication of his new temple. In a majestic accompanied recitative, which gives as much importance to the opulent orchestral interludes as it does to the fine solo vocal line, divided violas and two solo bassoons create a sumptuously dark interior to the orchestral sound which is quite unique in all Handel’s oratorios and turns an accompanied recitative into one of the composer’s most memorable descriptive movements. La naissance de l’oratorio en Angleterre fut un événement particulièrement curieux. À la Taverne de la Couronne et de l’Ancre, le 23 février 1732, jour du quarante-septième anniversaire de Haendel, son ami Bernard Gates dirigea trois représentations d’une version révisée d’Esther, œuvre interprétée auparavant en 1718 sous la forme d’un ballet de cour au Cannons. Gates dirigea son chœur depuis la Chapelle Royale et, selon le vicomte Perceval, «cet oratorio, ou opéra religieux, est très beau, et l’assistance fut tout à fait enchantée». En fait, ces premières représentations d’oratorios à Londres eurent un tel succès que la princesse Anne, qui prenait des leçons de clavecin avec Haendel, lui demanda de faire jouer son œuvre au King’s Theatre, dans le quartier du Haymarket. Le Daily Journal annonça une représentation le 2 mai de «L’histoire sacrée d’Esther, oratorio en anglais. Composé autrefois par Mr. Haendel, et maintenant révisé par lui, avec plusieurs ajouts, il sera interprété par un grand nombre des meilleures voix et instruments. N.B. Il n’y aura pas d’action sur la scène, mais le théâtre sera convenablement aménagé pour le public». En l’occurrence, Esther fut interprété six fois et Haendel put placer 700 livres dans les South Sea Annuities dès la troisième représentation. Haendel avait ardemment désiré trouver un style de musique nouveau qui pût ranimer l’intérêt du public. Pendant vingt ans il avait présenté des opéras à Londres, mais les dernières saisons avaient eu de moins en moins de succès, le public refusant d’assister à des œuvres mises en scène en italien. Bon nombre d’anciens amis et musiciens de Haendel l’abandonnaient, ce qui avait pour effet de le plonger dans une dépression et d’affaiblir son compte en banque. Le succès d’Esther lança l’oratorio à Londres et aiguilla Haendel sur une nouvelle voie qui allait demeurer son principal champ de composition pour le restant de sa vie. Ces oratorios anglais abondaient en arias, en duos, en ouvertures splendides et en chœurs pittoresques. Dans les opéras de Haendel, les arias étaient habituellement amenées à travers la situation dramatique: les arias d’oratorio présentent en général un commentaire plus vaste sur la condition humaine. Même si le spectre émotionnel des arias d’oratorio n’est pas aussi étendu que celui des opéras, la diversité des caractères, la qualité des mélodies et l’utilisation unique des couleurs de l’orchestre par le compositeur ont un très grand attrait. L’«Interlude Musical» Le choix d’Hercule fut interprété pour la première fois à Covent Garden le 1er mars 1751, où il fut présenté comme «nouvel acte supplémentaire» à l’oratorio Le festin d’Alexandre. Pratiquement les trois quarts de la partition provenaient de la musique que Haendel avait écrite pour une production d’Alceste que lui avait commandée John Rich, le directeur de Covent Garden. La pièce ne fut jamais mise en scène, sans doute parce que trop ambitieuse, et le livret disparut: la musique de Haendel, comme le décor de Servandoni, furent recyclés. Le nouvel Interlude est une simple allégorie montrant le jeune Hercule tenté de prendre deux directions différentes: d’une part, le Plaisir lui offre une vie sans souci, avec des fontaines fraîches, des berceaux de verdure ombragés, de la musique, de la bonne chère et des suggestions discrètes de possibles échanges de tendresses amoureuses. Tenté, Hercule écoute les remontrances de la Vertu, qui finit par le rallier à sa cause, surtout grâce à sa promesse d’immortalité. Le Plaisir et la Vertu défendent chacun leur cause assez longuement, mais lorsque Hercule exprime finalement son choix, Haendel lui confie une aria qui est un véritable joyau. Les instruments à cordes, qui jouent dans la riche clef de mi majeur, représentent de douces brises, sur lesquelles l’alto fait planer la plus exquise des mélodies. La ligne de basse descendante accompagnant la répétition finale sur une note de «Can I those wilds of joy survey» est particulièrement ravissante. La première représentation de Saul le 16 janvier 1739 au King’s Theatre fut «reçue sous les applaudissements généraux d’un public nombreux et formidable», dont faisait partie la famille royale. Ce jugement favorable était mérité car l’œuvre contenait des passages de grande qualité, tant pour les solistes que pour le chœur, et certaines couleurs orchestrales particulièrement spectaculaires. L’interlude amoureux que Jennens intercale dans son intrigue concerne Michal, la plus jeune fille de Saul, amoureuse de David. La désapprobation de Saul contraint tout d’abord les jeunes gens à dissimuler leurs sentiments. C’est seulement au second acte, après que David se soit vu sauvé de la peine de mort, que les amoureux parviennent à se déclarer leur amour mutuel au cours d’un charmant duo. Haendel établit ici un caractère résolument pastoral, soutenant les voix par des cordes et deux hautbois. «La tête de Mr. Haendel est plus que jamais emplie d’asticots. J’ai trouvé hier dans son bureau un instrument très étrange qu’il appelle carillon … avec cet instrument cyclopéen, il projette de rendre le pauvre Saul complètement fou.» Dans le premier acte, le nouveau jouet de Haendel parvient à produire l’effet escompté, et Saul, extrêmement jaloux d’entendre dire que David a abattu «des dizaines de milliers» de gens au cours de la bataille alors que lui-même n’en a tué que quelques «milliers», imagine que sa vie est menacée par le jeune guerrier. Cette accusation n’est pas justifiée et David se laisse persuader de chanter une aria apaisante au son de la harpe afin de calmer la folie de Saul. Bien que Haendel n’introduise l’instrument que plus tard dans la partition, les accords des cordes délicatement caressées évoquent un accompagnement de harpe sur lequel Haendel fait flotter l’une de ses superbes mélodies vocales. Présenté pour la première fois à Covent Garden en mars 1749, le Salomon de Haendel est une partition majestueuse exigeant un double chœur et un grand orchestre. Après quatre oratorios belliqueux, Haendel se tourne vers un thème littéraire présentant l’image d’une civilisation dans son âge d’or. Il y avait sans doute un lien avec l’Angleterre sous George II, mais Haendel, atteignant le terme de sa période de composition d’oratorios, avait également à cœur de choisir un thème littéraire correspondant à ses croyances personnelles. Dans le premier acte de l’oratorio, après avoir présenté la grande inauguration du temple de Salomon récemment terminé, Haendel emmène l’auditeur vers une région idyllique, où Salomon est d’humeur modeste. En mi majeur (la même clé que dans «Yet, can I hear that dulcet lay»), Haendel produit une fois de plus un véritable joyau, grâce à une merveilleuse mélodie soutenue par un accompagnement paisible aux cordes. Cette mélodie fut ultérieurement adaptée pour l’hymne «Salomon». Après les cérémonies d’ouverture du premier acte, Salomon accueille sa femme, la fille de Pharao (à ne pas confondre avec la Reine de Sheba, qui entre en scène au troisième acte), et lui promet un nouveau palais. L’attirance de Salomon pour sa reine est évidente, Haendel renforçant ce sentiment en composant un hymne à leur amour éternel. Sur une ligne de basse entraînante et ponctué de délicieux échanges entre les deux solistes, «Welcome as the dawn of day» est l’un des duos les plus rayonnants du compositeur. L’accompagnement orchestral est admirablement conçu, faisant écho au «my queen», «my king» des parties vocales au moyen des violons sautant d’une octave à l’autre, tout en mettant en avant les parties solistes avec de superbes contre-chants. La richesse de l’orchestration de Salomon n’est jamais aussi apparente que dans la partition extatique accompagnant la dédicace de Salomon à son nouveau temple. Dans un majestueux récitatif accompagné, qui donne autant d’importance aux opulents interludes orchestraux qu’à la magnifique ligne vocale soliste, les altos divisés et les deux bassons solos confèrent au son de l’orchestre une somptueuse obscurité, tout à fait particulière aux oratorios de Haendel, et transforment le récitatif accompagné en l’un des mouvements descriptifs les plus mémorables. Die Geburt des Oratoriums in England war ein ganz besonders kurioses Ereignis. An Händels 47. Geburtstag am 23. Februar 1732 leitete sein Freund Bernard Gates in der Taverne „Crown and Anchor“ drei Aufführungen, welche Überarbeitungen von Esther waren, einem Werk, das zuvor 1718 im Cannons-Theater als Masque („Maskenspiel“) aufgeführt worden war. Gates leitete seinen Chor von der Chapel Royal aus, und der Viscount Perceval äußerte sich wie folgt: „Dieses Oratorium oder biblische Oper ist gar vorzüglich, und das Publikum war zuhöchst erfreut“. In der Tat waren die ersten Londoner Oratoriumsaufführungen so erfolgreich, daß Händels königliche Spinettschülerin, Prinzessin Anne, die Aufführung des Werks im King’s Theatre im Haymarket forderte. Die Tageszeitung Daily Journal kündigte für den 2. Mai die folgende Aufführung an: „Die biblische Geschichte der Esther: ein Oratorium in englischer Sprache. Ursprünglich von Herrn Händel komponiert, und nun von ihm überarbeitet, mit mehreren Zusätzen; soll von einer Vielzahl der besten Sänger und Spieler aufgeführt werden. N.B. Ohne Szene, doch das Haus wird ordentlich für das Publikum ausgestattet.“ Schließlich wurde Esther sechsmal gespielt, und Händel konnte bereits nach der dritten Aufführung £700 in Rentenpapieren aus der Südsee anlegen. Es war für Händel dringend nötig gewesen, einen neuen Musikstil zu finden, mit dem er das Interesse der Öffentlichkeit wieder wecken konnte. Zwanzig Jahre lang hatte er Opern in London präsentiert, doch in den letzten Saisons ließ der Erfolg immer mehr nach, denn dem Publikum widerstrebte es, Inszenierungen in italienischer Sprache zu besuchen. Viele von Händels früheren Freunden und Musikern verließen ihn. Dies hatte bei ihm sowohl Depressionen als auch ein dahinschwindendes Bankkonto zur Folge. Mit dem Erfolg von Esther wurde das Oratorium in London eingeführt, und es wies Händel bei seinen Kompositionen in eine Richtung, die sich für den Rest seines Lebens als sein hauptsächlicher Wirkungskreis erweisen sollte. Jene englischen Oratorien enthielten eine Fülle von Arien, Duetten, ausgezeichneten Ouvertüren und dramatischen Chören. In Händels Opern erwuchsen Arien hauptsächlich aus einer dramatischen Situation: die Oratoriumsarien stellen im allgemeinen eine umfassendere Erläuterung der menschlichen Lage. Obgleich die Palette der Emotionen bei den Oratoriumsarien vielleicht nicht ganz so breitgefächert ist wie dies bei der Oper der Fall ist, sind die unterschiedlichen Stimmungen, die Klangfarbe der Melodien und die einzigartige Verwendung der Orchesterfarben durch den Komponisten ungemein anziehend. Das „musikalische Zwischenspiel“ Die Wahl des Herkules wurde erstmals am 1. März 1751 in Covent Garden aufgeführt, wo es als „ein zusätzlicher neuer Akt“ zum Oratorium Das Alexanderfest angeboten wurde. Nahezu drei Viertel der Partitur waren aus der Musik umgeschrieben worden, die Händel (im Auftrag von John Rich, dem Leiter von Covent Garden) für eine Produktion von Alceste komponiert hatte. Das Stück wurde niemals zur Aufführung gebracht, vielleicht weil es in viel zu großem Umfang konzipiert worden war, und das Libretto verschwand: sowohl Händels Musik als auch Servandonis Kulissen wurden „recycelt“. Das neue Zwischenspiel war eine einfache Allegorie, bei der der junge Herkules zwischen zwei Gegensätzen hin- und hergerissen ist: zum einen bietet ihm das Vergnügen ein leichtes Leben mit kühlen Brunnen, schattigen Lauben, Musik, Festgelagen und kokett phrasierten Andeutungen von Liebeständeleien. Davon in Versuchung geführt hört Herkules die Mahnungen der Tugend, die ihn schließlich für sich gewinnt—besonders wegen des Versprechens der Unsterblichkeit. Sowohl das Vergnügen als auch die Tugend legen ihre Gründe ausführlich dar, aber als Herkules schließlich zu Wort kommt, präsentiert Händel ihn mit einer Arie, die ein wahres Meisterwerk ist. Die Streicher, die in der klangvollen Tonart E-Dur spielen, stellen sanften Brise dar, über die die Viola die köstlichste aller Melodien streichen läßt. Die fallende Baßlinie unter der letzten, einnotigen Wiederholung von „Can I those wilds of joy survey “ ist atemberaubend. Die Uraufführung von Saul am 16. Januar 1739 am King’s Theatre wurde „mit großem Applaus von einem zahlreichen und vorzüglichen Publikum begrüßt“, unter dem sich die Königsfamilie befand. Der Beifall war wohlverdient, denn das Werk war voller großer Musik sowohl für die Solisten als auch für den Chor und enthielt auch einige besonders spektakuläre Orchesterfarben. Das amouröse Zwischenspiel, das Jennens in seine Handlung einfügt, betrifft Michal, Sauls jüngste Tochter, die sich in David verliebt hat. Angesichts Sauls Mißbilligung müssen sie ihre Gefühle anfangs unterdrücken. Erst im zweiten Akt, nachdem David die Todesstrafe erlassen wurde, können sie beide ihre gegenseitige Liebe erklären, und dies tun sie in einem bezaubernden Duett. Händel ist in einer herrlich pastoralen Stimmung und unterstützt die Stimmen mit Streichern und zwei Oboen. „Herr Händel ist schrulliger denn je. Gestern fand ich in seinem Zimmer ein höchst merkwürdiges Instrument, das er Carillon nennt … mit diesem zyklopischen Instrument beabsichtigt er, den armen Saul völlig verrückt zu machen.“ Im ersten Akt hat Händels neues Spielzeug die gewünschte Wirkung, und Saul, der außerordentlich neidisch ist, weil David angeblich „Zehntausende“ im Kampf zur Strecke gebracht hat, während er nur „Tausende“ auf dem Kerbholz hat, bildet sich ein, daß sein Leben von dem jungen Krieger bedroht wird. David ist unschuldig und läßt sich überzeugen, eine besänftigende Arie zu singen und auf seiner Harfe zu spielen, um Sauls Wahn zu beruhigen. Obgleich Händel bis später in der Partitur wartet, bis er das Instrument erstmals einzusetzt, erinnern die sanft gestrichenen Streichakkorde stark an eine Harfenbegleitung, über die Händel eine weitere seiner herrlichen Gesangsmelodien schweben läßt. Händels Salomon, der erstmals im März 1749 in Covent Garden zu hören war, war eine aufwendige Partitur, die einen Doppelchor und ein großes Orchester erforderte. Nach vier kriegerischen Oratorien wandte sich Händel nun einem Stoff zu, der das Bild einer Zivilisation in ihrer Blütezeit präsentiert. Es ließen sich vermutlich Parallelen zu England unter George II ziehen, doch Händel kam auch in die letzte Phase der Oratorienkomposition, in der er Stoffe wählte, die seinen eigenen persönlichen Überzeugungen entsprachen. Im ersten Akt des Oratoriums, nachdem die Einweihung von Salomons neugebautem Tempel gezeigt wird, entführt Händel den Hörer in eine idyllische Landschaft, wo sich ein demütig gestimmter Salomon befindet. Wieder bringt Händel etwas Meisterhaftes in E-Dur (der gleichen Tonart wie „Yet, can I hear that dulcet lay“) hervor, eine wunderbare Melodie, die über einer sanft fließenden Streicherbegleitung gesetzt ist. Die Melodie wurde später als die Kirchenliedmelodie „Salomon“ arrangiert. Nach den Eröffnungsfeierlichkeiten des ersten Aktes heißt Salomon seine Frau, die Tochter des Pharaos (nicht mit der Königin von Sheba zu verwechseln, die erst im dritten Akt auftritt), willkommen, und verspricht ihr einen neuen Palast. Beim Zuhörer herrschen keinerlei Zweifel, darüber, wie sehr Salomon von der Königin angezogen wird, und um dieses Gefühl zu verstärken, bringt Händel eine Hymne an ihre unsterbliche Liebe. Angeordnet über einer laufenden Baßfiguration, ist „Welcome as the dawn of day“ eines der leuchtendsten Duette des Komponisten voller köstlichem Zusammenspiel zwischen den beiden Solisten. Die Orchesterbegleitung ist wunderbar abgeschätzt; sie ist ein Echo des gurrenden „my queen“ „my king“ der Sänger in den Geigen in Oktavensprüngen, während die Solozeilen mit herrlichen Gegenmelodien wirkungsvoll untermalt werden. Die volle Instrumentierung von Salomon ist nirgends offensichtlicher als bei der ekstatischen Instrumentalkomposition, die bei Salomons Einweihung seines neuen Tempels zu hören ist. In einem majestätisch begleiteten Rezitativ, das den opulenten Orchesterzwischenspielen ebensoviel Wichtigkeit beimißt wie der feinen Sologesangslinie; geteilte Violen und zwei Solofagotte bewirken ein üppig dunkles Innenleben des Orchesterklangs. Dies ist in allen von Händels Oratorien ziemlich einzigartig und verwandelt einen begleiteten Rezitativ in einen der denkwürdigsten beschreibenden Sätze.